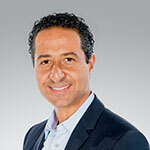 Paul Haddad is the president of a4, Altice USA’s advanced advertising and data solutions business. An established veteran of the advertising and technology industries, Paul has been a pioneer in helping companies utilize data to make smarter business decisions. His vision to help advertisers simplify their digital efforts across all screens while maximizing their return has now been realized under his leadership with the establishment of a4. a4 is the combination of the company’s legacy commercialized data business and local sales mechanisms along with recently acquired ad tech firms, Audience Partners and Placemedia. The result is a single solution for advertisers looking for effective multi-screen advertising tools at a national scale. Paul joined Altice in 2016 as the global chief data officer for the group where he led the creation and monetization of a world-class data analytics practice across all of Altice Telecom and Media subsidiaries. Previously Paul was senior vice president & GM, Advanced Data Analytics for Cablevision Media Sales. He founded and led the company’s cutting-edge data business, which leverages Cablevision’s census-level audience data comprised of de-identified set-top box data from millions of households in the New York DMA. Prior to joining Cablevision, Paul served as senior vice president & GM of Concurrent’s Global Media Data and Advertising Solutions business. He also held an expanded responsibility as general manager of Concurrent’s combined video and data businesses in Europe, Middle East, and Africa. Previously, he was co-founder and ceo of Solusia Technologies, a leading information management software provider focused on the wireless industry. Before this, he spent nine years at Nortel in various leadership roles ranging from optical networks systems engineering, product management, and general management of the bandwidth trading and wireless backhaul divisions. Paul holds patents in the advanced data & information management systems, as well as bandwidth exchange technologies. He holds a B.S degree in electrical engineering from Concordia University (Montreal) and is fluent in five languages.